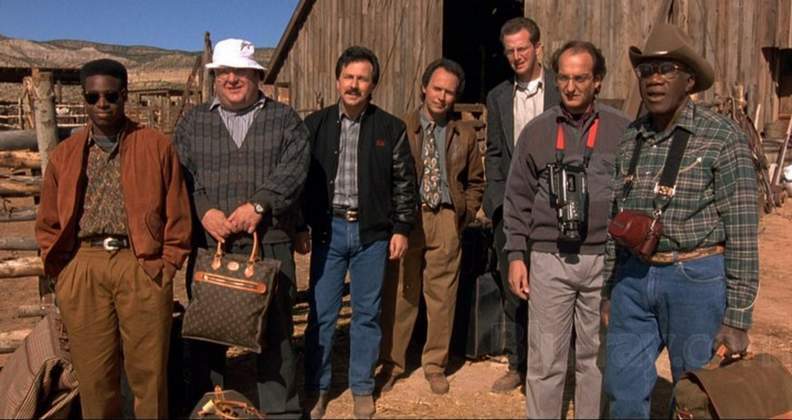 Vacations are always better when, as comedy screenwriters Lowell Ganz and Babaloo Mandel note, "you know who you're taking a trip with" and this is especially true when you're asking an audience of strangers around the world to come along. Passionate about telling a character-driven story "even in a high-concept comedy" like City Slickers, which was based on an idea Billy Crystal dreamed up while watching a TV show about fantasy vacations, Ganz and Mandel take the time to develop the characters beyond the recognizable men bringing them to life. Centered on three lifelong friends comprised of Crystal's neurotic Mitch, Daniel Stern's mild-mannered pushover Phil, and Bruno Kirby's obligatory, macho alpha male Ed, Slickers opens during the Running of the Bulls in Pamplona, Spain which puts their lives and relationship to the test in what we discover is just the latest in a long line of wild excursions. Though broadly comic at first glance, the sequence works well on another level beyond simply establishing who the leads are as we begin to foreshadow what conflicts the three might need to resolve over the course of what's been far too often dismissed as a midlife crisis comedy (when in truth taking inventory of one’s life can happen at any age). "It's never enough for you," an injured Mitch tells Ed after conceding that not only are their "adventures becoming stupid" but, as his patient wife Barbara (Patricia Wettig) notes, perhaps these trips "are a desperate attempt to cling to" their youth. Keeping his head down for a year until the annual depression of his birthday sets in, after a catastrophic start to his thirty-ninth year leads to problems at work, a breakdown at Career Day after his son tells classmates he's a submarine commander, and a major blow up between Phil and his domineering wife (which magnifies his recent malaise), Barbara practically pushes Mitch out the door. A present from Phil and Ed, this time the destination takes the three to New Mexico. Hoping to fulfill his childhood dream to be cowboy "Mitchie the Kid," they set off to drive a herd of cattle up to Colorado alongside a father/son duo of dentists from Baltimore, a pair of brothers who run a bestselling ice cream company, and a beautiful woman whose friend bailed at the last minute. And while this is when the action truly begins, from a narrative perspective it's important to realize that – by the time they've landed – nearly an entire act has gone by where we've formed a solid foundation with the characters, which doesn't often happen today in films that would instead prefer to start in the middle to cater to the shortest of attention spans. 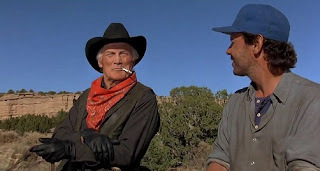 Using Jack Palance's iconic performance in Shane as the inspiration for his Academy award-winning role as Curly the intimidating Trail Boss who, as Mitch says "the toughest man I've ever seen in my life," the New Yorker's mile-a-minute one-liners and stampede causing portable coffee maker initially rubs Curly the wrong way. Butting heads from the start, once Mitch stands up to him after apologizing for his earlier jokes, Palance's cowboy becomes a surprising source of enigmatic wisdom to Mitch and as such, helps the viewer take Slickers more seriously as a western than spoof. Comparing the "City Slickers" to Curly, as Ganz and Mandel opine in one of this Shout Select edition's many behind-the-scenes featurettes, one of their biggest challenges as screenwriters was that in reality, "these characters had no business being in his world." 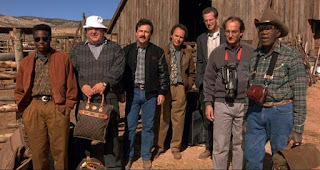 Raising the stakes as well as decreasing the number of talented actors onscreen (including David Paymer and Helen Slater), the writers treated it like an Agatha Christie style murder mystery in order to drop the ensemble down from eleven people to our main three organically. And illustrating just how much has happened along the way, by the time it becomes another one of Mitch, Phil, and Ed's legitimate adventures, we realize that we aren't riding alongside the same three men we first met back in Spain. In other words, all the time spent inviting us "to move in with the characters" ensured that rather than a mere gimmicky western comedy, midlife crisis movie, or fish-out-of-water story, we're watching a tale about three men who learn that rather than to try to recapture their youth, it's time to grow up into the men they really want to be. 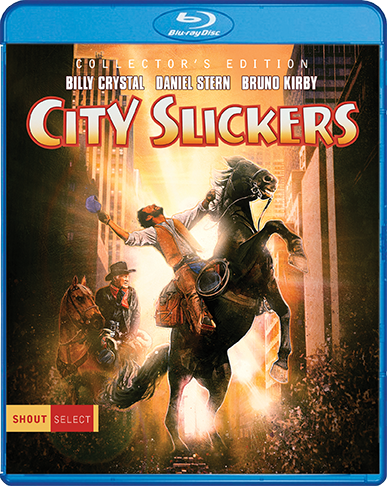 Featuring terrific performances by its impressive cast including the many supporting players who each get the chance to steal at least one scene, in the end it's Palance, Crystal, Kirby, and especially Stern who do a great job of balancing out pathos and drama with the comedy as leads. Inventively directed by Ron Underwood, who punctuates some of the jokes by reframing them in a western homage that makes them even funnier as in a memorable ode to Sergio Leone's The Good, The Bad, and The Ugly, the newly released 4K scanned print on Shout's Blu-ray showcases the film's beauty while also giving Underwood, Crystal, and Stern an audio commentary track. And although some of the bonus featurettes get repetitive as they reuse interview clips under different headings – making you wonder if they should've just served up one long featurette – overall the quality of the bonus material on this disc is first rate. Featuring two deleted scenes that would've changed the ending of the movie, with Underwood explaining why they were left on the cutting room floor in tandem with Ganz and Mandel's reflections on how to not only set up a character-driven storyline but also go against viewer expectations by shifting tone and emphasis, we're able to appreciate just how much work went into creating this contemporary classic. That being said, admittedly it's a film I didn't connect with all that much upon its initial release mostly because as a child, I couldn't relate to much beyond Crystal's one-liners or moments of broad situational humor. However, now that I'm roughly the same age as the film's characters, it proved to be an ideal time to revisit the work that inspired my favorite Academy Awards ceremony of all time, as Crystal started improvising jokes about his costar's strength and virility after Palance won his award. 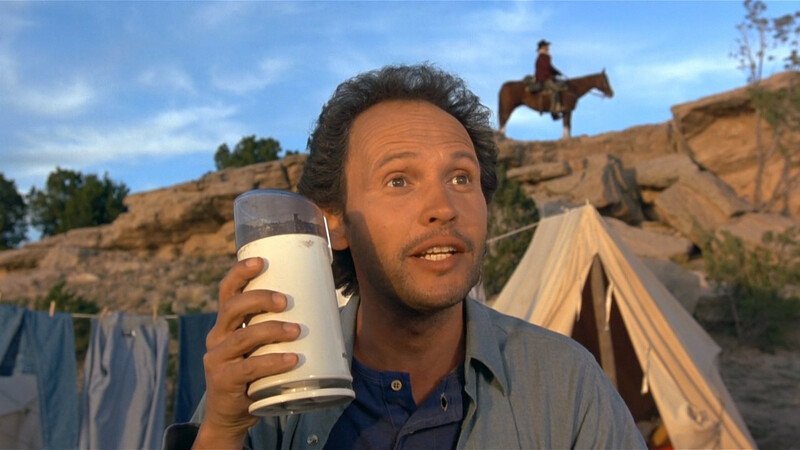 Unlike too many generic contemporary comedies sure to be forgotten as soon as the credits roll, City Slickers holds up remarkably well twenty-seven years later, undoubtedly because not only do we know our characters, they're people we still recognize today, whether running from a bull, freaking out on their birthday, or riding the range.